Mark & Olivia with Isla, Luca and baby Indy. A husband and wife team; a designer and a wine guy; add three kids and you have The Cellar d'Or. Mark, the brain behind the bottles of hand selected wine and cider- a surfer, raised in the suburbs just north of Manhattan and on Montauk's Ditch Plains; with his extensive wine knowledge from years in the wine business and his laid-back personality, he is the body and soul of the shop. Olivia, a locally grown Cornell alum with a masters in Landscape Architecture, she married into the wine world and dove right in. Upon starting a family, she realized she wanted her kiddos to have the same type of childhood she did; one full of pulling ripe fruit straight from the vines, digging in the dirt, and knowing your neighbors. So she persuaded her ocean-loving husband and returned to her roots, setting up shop in Ithaca. Together, they decided to combine all of their passions by starting up a retail wine boutique. The Cellar d’Or reflects their love for design, wine, and relaxation; with no stuffy wine talk because drinking and learning about wine shouldn't be intimidating. You can expect to find small-production, terroir-driven wines and ciders that represent some of the greatest growers and winemakers from around the world. The selections make for a comprehensive array of indulgent or affordable wines and ciders that will please anyone who walks through the door. Eden, feverishly pouring for a customer at on of our friday night tastings. 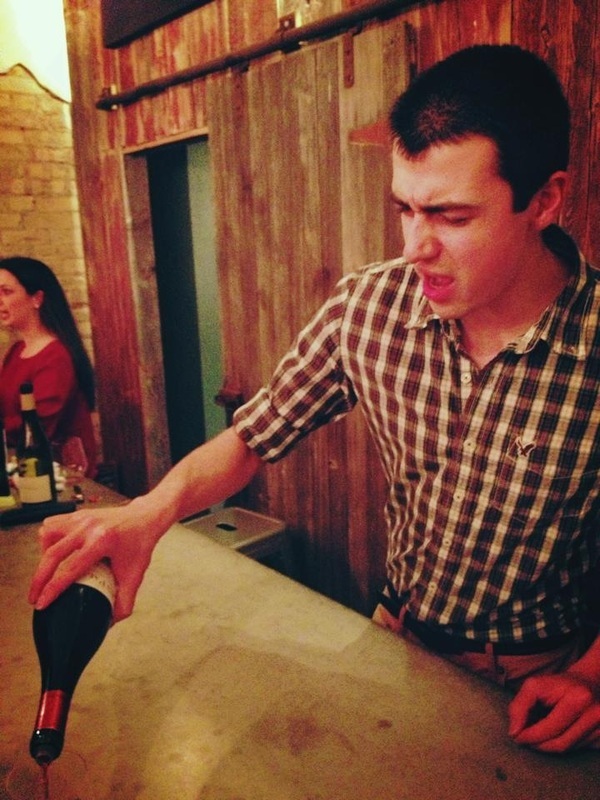 His infectious enthusiasm for wine will win you over, and he'll make you try something you've never had before. He's an equal opportunity taster, and gets excited about wines from all over the world. Born and raised in Ithaca, Eden recently caught "the wine bug" after years of working in the restaurant biz and taking the wines class at TC3. His natural knack for breaking down flavors and textures in wine, as well as his ability to just be so down to earth about talking the stuff, will take the guesswork out of the age old question of "what should I drink"? His non-stop desire for learning everything wine as well as his desire to learn our customers' palates makes him an integral part of the shop, and you can always rely on him to help you find what you're looking for. You'll find Eden at the helm most evenings and sundays, and if you join us for a friday tasting you'll find him tag-team pouring with Mark.